In addition to the annual flagship mate 20, Huawei will launch a new generation of smart wearable watch GT and other devices at the New London launch Conference on October 16 this year. 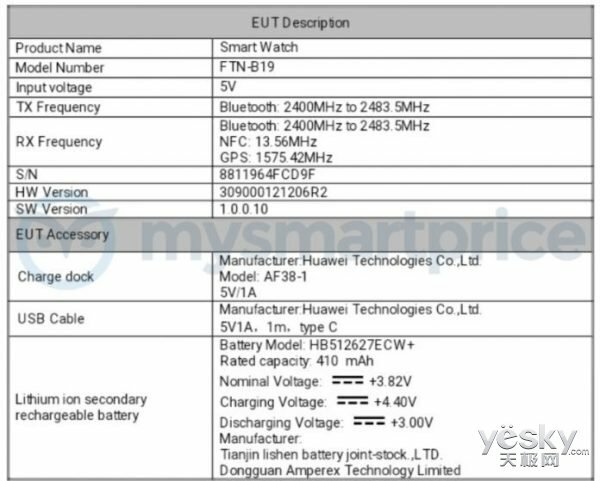 Prior to the Huawei Watch GT has been the U.S. FCC and the Russian EEC two certification, including models, battery capacity and other information details have been basically exposed. And recently, there are foreign sites exposed the final configuration of this smart watch, let us see fast. According to the website, the Huawei Watch GT is equipped with a 1.4-inch AMOLED circular touch dial with a resolution of 454 x 454, and the entire case is only 10.4mm thick. In addition to the appearance dimension upgrades, this smart watch will also have a large configuration upgrade. The Huawei Watch GT is likely to be powered by the newly released Qualcomm Snapdragon Dragon wear 3100 Wearable device processor, supplemented by a combination of 768MB RAM and 4GB ROM storage, running the Google Wearos system. In terms of functionality, the Huawei Watch GT incorporates a heart rate monitor, GPS and compass, and supports IP68 or 5-ATM waterproofing. Huawei is partnering with Firstbeat to provide virtual running coaching capabilities. In addition, it supports Huawei Trusleep automatic sleep tracking technology. In terms of battery life, the Huawei Watch GT incorporates a 410mAh battery and supports 5W charging, and is expected to be up to 14 days.